A few weeks back, primary school teacher Margherita Aurora, in the small town of Copparo in central Italy, was intrigued when one of her students, Matteo, used an unfamiliar word in a written assignment. Matteo described a flower as "petaloso" ("full of petals"). The word doesn't officially exist in the Italian dictionary, but grammatically it makes sense as a combination of "petalo" ("petal") and the suffix "-oso" ("full of"). The assignment got Aurora thinking – could the eight-year-old Matteo have invented a new word? With his teacher's help, the student wrote to the Accademia della Crusca – the institution that oversees the use of the Italian language – to ask for their opinion. To their surprise, the pair got an encouraging reply. "The word you invented is well formed and could be used in the Italian language," one of the Crusca's top linguistic experts wrote. "It is beautiful and clear." But, the linguist added, for a word to officially be part of the Italian language, a large number of people need to use it and understand its meaning. "If you manage to spread your word among many people who start saying 'What a petaloso flower this is! ', then petaloso will have become a word in Italian." 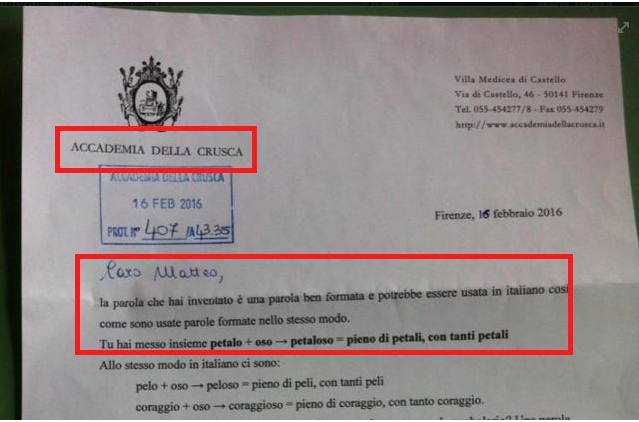 Matteo's teacher was touched by the reply – "this is worth more than a thousand Italian lessons" she wrote on her Facebook account on Monday – and shared pictures of the letter. Inadvertently, she triggered a movement to do exactly what the Crusca had asked: make "petaloso" a widely known and used word. MONTAGNE: Matteo decided that if his word was so beautiful it should be in the dictionary. He wrote a letter to Italy's national language academy, the Accademia della Crusca. VERA GHENO: We were all, you know, oohing and aahing over it (laughter). INSKEEP: Vera Gheno, a linguist, was in the room when that letter came in and one of her colleagues wrote Matteo back. She said people would have to use petaloso in conversation for it to be included in the dictionary. MONTAGNE: Matteo's teacher posted the letter on Facebook and soon petaloso became one of the top trending topics on Twitter in the world. People everywhere started using the word to help Matteo get it in the dictionary. Even the Italian prime minister tweeted about petaloso, congratulating Matteo. INSKEEP: Now, petaloso is not officially a word yet. Still, Vera Gheno, the linguist, says she hopes Matteo learns that language is constantly evolving. This is heart-warming but weird. The first level of weirdness is the idea that whether a word is "in the language" depends on whether it's included in an authoritative dictionary or (in this case) recognized by a duly constituted authority. But it's even weirder that a linguist should apparently think that a morphologically regular and semantically transparent combination should be considered to be a duly-constituted word (and therefore be listed in the official dictionary) if and only if people use it often enough. That's an appropriate attitude to take towards a completely new coinage, or a semantically opaque composite form — for a humorous take on this situation, see "Ozay, dot-nose, kangamangous", 12/5/2008. But in any language with a reasonably complex morphology, there are millions of potential words made available by morphologically and semantically regular processes. If some of these are in common use, then maybe it makes sense to add them to the official lists — especially because forms in common use are likely to pick up extra connotations or more specific references. But whether such regular and transparent forms are "in the language" or not doesn't depend on whether anyone has thought of using them yet, much less on whether they've been picked up by some official list. In this case, it seems that the regularity is only partial, as is often the case in derivational morphology. Italian -oso is often added to nouns to make adjectives — thus pericolo "danger" → pericoloso "dangerous" = "full of danger"; gioia "joy"→ gioioso "joyous" = "full of joy". But ritmo "rhythm" doesn't have a corresponding ritmoso, as far as dictionaries tell me anyhow, nor does acido "acid" have a corresponding adidoso. If I've got this right, then it's a bit like the distribution of -ous in English, where we have danger→ dangerous, glory→ glorious, joy → joyous, but not anger → *angerous, folly → *follious, toy → *toyous. The non-occurence of angerous isn't just because no one got around to it yet, it's because -ous started out as a version of Latin -ōsus and its Romance derivatives, and has only rarely and erratically been applied to English words of non-Romance origin. This role of etymological history doesn't seem to apply in Italian, so the lack of ritmoso must reflect more general form of morphological quasi-regularity, such as blocking by ritmato or ritmico. I'm not sure where this leaves petaloso — no doubt some commenters with deeper knowledge of Italian will be able to set me straight. I can't tell from this much of the letter whether it raises morphological quasi-regularity, blocking, and related issues. The media coverage makes it seem like petaloso is just a regular formation that no one got around to yet, like English unrevacuumed or thirty-seven-petaled — but maybe it's more like angerous? If you see or hear someone reject a word by saying it’s “not a word”, you can reasonably assume that they mean it’s not a word they like, not a word they would use, not a word in standard usage, not a word in a certain dictionary, not a suitable word for the context, and so on. There’s a difference, and it matters. If this is not obvious to you, then I invite you to work through a few examples in your own language. Now we can add un- and -ed to the verb, to form unvacuumed meaning "that has not been cleaned by a vacuum cleaner", or we can add re- and -ed to form revacuumed "cleaned again with a vacuum cleaner". Neither unvacuumed nor revacuumed is in the OED; unvacuumed is in the English Wiktionary while revacuumed isn't; but both of them are clearly English words. And writers have been using unvacuumed and revacuumed for years, without feeling the need to check with any authorities. Google doesn't currently find any instances of unrevacuumed, but I wouldn't hesitate to use it if the concept were relevant — whereas I wouldn't use *vacuumous unironically. It happens to be the case that "eleven-petaled" is not common enough to make the Google ngrams threshold (of 40 published instances in a year), and needless to say it isn't in any dictionaries. But there are a few examples Out There, and presumably the people (for example) who catalogued the Tang Dynasty "Floor tile with eleven-petaled lotus" at the Dunhuang Research Academy felt no need to check with the OED before using this (compound) word. So whatever the linguistic lesson really is in this case, it's more subtle than just the question of whether petaloso is in the dictionary, or whether enough people use it for a Word Induction Ceremony to be scheduled. (See e.g. Peppe Cariki, "Dopo “petaloso” i social lanciano “inzupposo”: tra la “Crusca” e il Mulino Bianco…", MeteoWeb 2/25/2016). As far as I can see, inzupposo "dunkful" (from inzuppare "to dunk" + -oso) is much less morphologically regular than petaloso, since there's no noun to supply the base form. So if inzupposo is to get its Word Induction Ceremony, it really does need some social (media?) support. The support for Matteo's coinage is cute, but it's not clear to me whether petaloso needs any backers to Be A Word. I would scarcely imagine this is the first time social media has led to the coining of a word–in fact social media, almost by definition–coins more words than flowers have petals. My Italian is più piccolo, but petaloso seems (even without a 1695 antecedent) a fabulous word to flower in any language–and would that English had such a succinct term. It may be a "fair call" @ Chips Mackinolty and @ myl, but the test will be whether petaloso prevails over obscure scientific usages in English … time will tell. Petalous may well appear in the OED, but that hardly indicates quotidian usage (rather it reflects a historical record). It would be fabulous @ myl to re-visit this in a few years to see whether petalous* or petaloso* has entered either or both languages. My cynical self says that an Italian fashion/perfume house will seize on petaloso and ram it down all our throats/noses. In 5 years tell me if I am wrong! * Both register as non-words on my spell check. Petaloso sounds like a musical direction: Play in a flowery manner. What does "full of petals" mean in the gloss? Having a region completely filled petals, being composed of petals, having constituent parts that are petals? Something different? Was the usage in essay a new (non-micro) sense (if that doesn't beg the question)? Incidentally, it’s “ritmico,” without the h.
Mark: On the basis of the BBC story, your reaction "heart-warming but weird" seems justified, but I got curious and found the full text of the letter to Matteo in the Italian media, and I think the linguist who wrote the letter (Maria Cristina Torchia) can be exonerated from the charge of thinking that a word isn't a word until it's in the dictionary. At worst it's just a case of a linguist trying to explain things to an eight-year-old lay person and not quite succeeding in evading her readers' everyday prescriptive assumptions. "La tua parola è bella e chiara, ma sai come fa una parola a entrare nel vocabolario? Una parola nuova non entra nel vocabolario quando qualcuno la inventa, anche se è una parola “bella” e utile. Perché entri in un vocabolario, infatti, bisogna che la parola nuova non sia conosciuta e usata solo da chi l’ha inventata, ma che la usino tante persone e che tante persone la capiscano." "È così che funziona: non sono gli studiosi, quelli che fanno i vocabolari, a decidere quali parole nuove sono belle o brutte, utili o inutili. Quando una parola nuova è sulla bocca di tutti (o di tanti), allora lo studioso capisce che quella parola è diventata una parola come le altre e la mette nel vocabolario." Way to repeat what I just said, Bob. Seems to me that the Accademia operates very much like our Académie française. For a long time it felt ludicrous to me to have an academy to regulate language, until I understood that it's not what they do. They don't decide what is or isn't correct French usage, they just write it down based on the usages they see. I don't think a lot of French people understand that. I agree with the explanation provided by @Bob Ladd. The letter is written for the young boy, it is safe to assume that the linguist writing the letter might have oversimplified the concepts. I recall my primary education in Italy, which took place not too long ago. Despite my teacher was not a linguist, but a very old fashioned grammar school graduated, I was taught that in our compositions we could only use words coming from the dictionary. The dictionary was somehow held as the ultimate depository of the True Italian Language™. I think it is also worth mentioning that Italian language is quite conservative in general and changes in the usage of words, or new words altogether, are usually frowned upon. We have the same morphological usage of prefixes and suffixes as in English (as many derive from Latin) but we do not really mix them with the same degree of liberty and creativity that I have noted in the English language. It is this conservative attitude, that aims to preserve a presumed "purity" of the language, that I think has caused the language to be flooded by anglicisms, as we have not been really willing to exploit the internal resources of Italian and preferred to import the new words directly. A lot of French people don’t understand it because it’s not true. The French Academy is infamous for its prescriptivism. @Tom S. Fox: We were posting at the same time. It happens. At least we agreed on the translation. I think "petalsome" would be a better English equivalent than "petalous". I guess one of the reasons why Italians stick to the dictionary and prescriptivism in general is the huge variety of so-called Italian dialects, many of which are mutually incomprehensible and should in fact be called separate languages. If everybody started to use their local vocabulary (or Italianized forms thereof) in Standard Italian the language would drastically change. Could not agree more! Above and beyond full blown dialect differences, formal Italian (as represented in the reputable Garzanti dictionary) cannot distinguish between gender of nouns (e.g. zucchina/zucchino) as these differ at times from one small locality to the next. And in dialect, try I cucuzzeddi di friiri, for size, for zucchini (or zucchine)! The Accademia della Crusca has got its work cut out, at the best of times. And @ Elsie, you are perfectly correct about the conservatism of the Italian language. I recently had a dialect translator decline to render some remarks from Galileo. He said the Italian was archaic, but he didn't want to "offend" Galileo in translating to a contemporary dialect. It was a decision I respect. I could pretty well read and translate the Galilelo text because, indeed, Italian has shifted very little over the centuries. This sounds like a more realistic but less satisfying version of Andrew Clements's novel"Frindle". @Judy remember, it took "frindle" years to get into the dictionary too! Of course, in English the phrase "full of petals" evokes an image more like https://www.youtube.com/watch?v=uNGBELsblQ0 (at least to me). Could this cow be described as petaloso in Italian, or does the -oso suffix not lend itself to that interpretation? Or, perhaps, might it work for Italians as the style of humour that violates pragmatic but not semantic norms? That style of humour would only violate grammatical norms, unless we're talking about a transgender cow. Interestingly, although "petalous" is not in use english, the compounds of it (and not "-petaled") are the common use in botanical parlance, hence monopetalous, polypetalous etc., although the prefix tends to be shortened to the number (3-petalous and so on) for brevity. That is indeed a fascinating plot-twist. I'd love to hear more discussion of this. A note on "That's how it works: it's not up to scholars who write dictionaries to decide which new words are beautiful or ugly, useful or useless. When a new word is on the lips of everyone (or lots of people), then the scholar sees that this word has become a word like any other and puts it in the dictionary." and "For a long time it felt ludicrous to me to have an academy to regulate language…": I'd say there are different approaches. In Estonia, conscious invention and design of Estonian language has been a well-established tradition for more than a century, and the tradition to have official bodies that issue not only descriptive, but also normative dictionaries, is only a little bit shorter. (Hey, we have even standardized our dialects.) These days, of course, there are people who protest this attitude, but they are just a (vocal) minority while everyone else finds the prescriptive practice very much acceptable (especially teachers). Of course, as far as I know, very few language communities have such an extreme attitude; partly, it can be explained with the local history of language politics, as everything concerning Estonian language and culture had a faint hint of opposition in Soviet times, so people "took the stand" in, e.g., fighting against superfluous Russian loans in Estonian. Still, nowadays, public normative acts don't raise any eyebrows – e.g., our current president has organized a couple of competitions to find new words for new concepts or to replace "clumsy" loans (like "infrastructure"), and I wouldn't be exactly convinced each one of those proposals that have made it to the dictionaries have had an ubiquitous presence in speech before that. Sounds like the apocryphal etymology of "quiz". Petaloso (n) 10^15 losos, or a thousand teralosos. Hello there. Being the so-called "linguist in the room" I'd like to add my two cents. First of all, the room's reaction (the ooohs and the aaahs) was for the very nice letter of the boy: carefully written in his beautiful handwriting, it was a lovely change from the many, many letters we usually get from adults (we receive, sometimes, mails from children, but it's certainly less common). Secondarily, suffixation is a quite common way of adding words to Italian dictionary: we have 'telefonino' from telefono+ino, for "mobile phone" (literally "little telephone"), lexicalized years ago, or 'ombrellone' from ombrello+one for "beach umbrella" (literally "big umbrella"). At the same time, the suffix -oso is extremely productive in Italian, and we may form new adjectives using it: we've already got "peloso" from pelo+oso 'hairy', "sassoso" from sasso+oso 'rocky', "spinoso" from spina+oso 'thorny, prickly' etc. What my colleague explained to Matteo is that, based on the already existing family of adjectives, 'petaloso' is, indeed, well-formed, but that no authority can help him in making it an "official" word of the Italian language. For that, it is necessary for it to be used by people, in context, of course. What happened next is that, after the teacher uploaded the Accademia's answer to her Facebook profile, a local newspaper wrote a story about it and suggested retweeting about the article using the hashtag #petaloso, hence spreading knowledge of the word. "Let's help Matteo getting his word registered in the dictionary!" – was the claim which got people so enthusiastically involved, especially after the Accademia's Twitter profile (managed by me) retweeted the article. This "campaign" became viral in an unpredictable way, not only becoming an international trending topic, but also causing a short, but intense campaign of instant marketing (with lots of Italian brands tweeting ads about "petaloso"). Of course, the majority of people thought that the Accademia had already accepted the word as part of the dictionary (which is impossible, because the Accademia has stopped writing dictionaries in 1923) or that tweeting about it would help achieving this goal. As I wrote above, the word must be inserted in natural contexts to be considered really widespread in use, so all the hype around it made "petaloso" known but does not mean that now the adjective will be included in any dictionary. Still, many people loved it and an equally high number of people hated it (especially because for a couple of days everybody was talking about it!). The viral effect of "petaloso" was probably caused by a series of factors: the adjective itself is nice and makes people think about spring; the story of the little boy who gets and answer from the Accademia, still perceived by a good percentage of Italians as very "remote", was quite "romanceable"… and social networks did the rest. I'd like to add one last thing: as a sociolinguist, I think that children in school must be taught the "norm", the correct usage of language; but, considering that a language, which is alive, evolves constantly, it is also nice that Matteo and his classmates have maybe learned that adding a new word to a language is, indeed, possible. Maybe this is not the case, but who knows? Oh, and by the way, my colleague Cristina, in her letter, quotes exactly Clement's novel "Frindle", which in Italian was translated as "Drilla". If you need more clarifications, feel free to ask your questions. "In English, the noun vacuum has come to be used as a shortened form of the compound vacuum cleaner […]. The noun vacuum is then predictably used as a verb…"
I would have some doubts about this, but I may be wrong of course. When I read this initially, my first thought was that 'vacuum' as a shortened form of 'vacuum cleaner' might be an American usage, as I'm not personally familiar with it (I'm Irish). The usual 'shortened form' of 'vacuum cleaner' in my experience is 'hoover'. However, I see that it's in both the Cambridge and Oxford online dictionaries without any indication that it's not used in Britain at least (whatever about Ireland). I'm now wondering how widespread that usage actually is on this side of the pond? Have I simply not been noticing it? I'd have to think about this some, but it's worth noting that ritmo isn't Latinate, but Greek, though obviously borrowed into (late) Latin. Hence the "rh" and "y" in English. Rhythmicus also existed.